An Emmy Award-winning writer for The Colbert Report follows in the (big) footsteps of Bigfoot: I Not Dead. Monsters have it tough. Besides being deeply misunderstood, they suffer from very real problems: Mummies have body image issues, Godzilla is going through an existential crisis, and creatures from the black lagoon face discrimination from creatures from the white lagoon. At heart, these monsters are human; after all, you are what you eat. 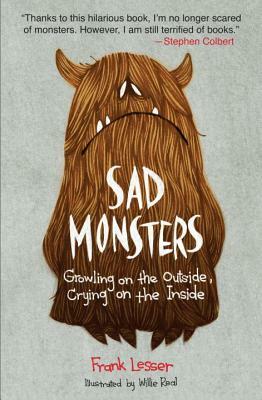 Quirkily illustrated, Sad Monsters hilariously documents the trials and tribulations of all the undead creatures monster-mad readers have grown to love, from vampires and werewolves, to chupacabras and sphinxes, and even claw-footed bathtubs. Frank Lesser is a writer for The Colbert Report. He was a film major and editor of the humor magazine at Brown University. He lives in New York.